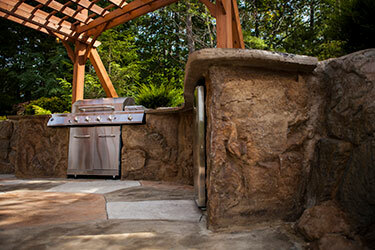 Can you picture your new outdoor kitchen & fire pit where you can relax and unwind? Get more out of your backyard while eating, entertaining and enjoying limitless time with your friends and family. Your new kitchen is fully customized with features you need the most while entertaining your friends and family. 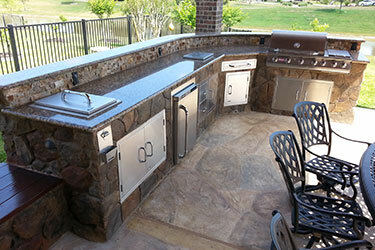 The outdoor kitchen is the “heart” of the outdoor room and a key component in outdoor entertaining and leisure. 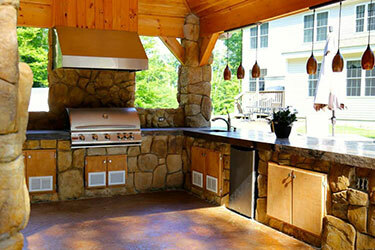 Your outdoor kitchen addition will be well thought out. What will you typically use your new outdoor space for? When entertaining guests, how many people will it need to accommodate? Having the right grill and appliances is essential to getting optimal use and enjoyment out of your outdoor kitchen space. When building, you want to consider the size of your patio, deck, and space where your outdoor kitchen will be located. It is important to make sure that the outdoor kitchen configurations work with the space and configures to keep walk ways open. We can build kitchens that are Straight (S-Series), L-Shape (L-Series), and U-Shape (U-Series) or Custom Configured. "The outdoor kitchen as part of an outdoor room is replacing the conventional backyard."